Back in the Rapids – Run. Ride. Roam. There were signs that today was going to have a few glitches, right from the get-go. Steve was trying to load the maps for our route, onto the GPS, when he threw up his arms, “I give up! It’s too hard!” It seemed the cycle routes given on the Italian cycling website weren’t appearing on the Garmin maps and nothing was matching as it should. In the end, he did a great job to put together a route, but we knew there’d be an element of “winging it” today. We set of at 8:15 and the start of the ride had us, once again, back in the rapids of traffic, on that horrible and scary road with trucks zooming past us. We did, finally, end up on a bridge, which had a pedestrian path crossing it, so we rode along that to get out of the traffic. We called into Casalmaggiore to pick up some supplies for the road and I went in to the supermarket to case the aisles. My first stop, as always, was the produce section and it was here that I learnt again to observe, observe, observe! Watching ad learning are the essential skills for travelling and as I stood waiting to select some apples from the bin, I noticed the lady in front of me was wearing a disposable plastic glove on one hand, Michael Jackson style. Hmmm, I hadn’t seen that before. I looked around me and noticed that every shopper in the fruit and veg department was wearing a plastic glove. OK, I’ve obviously missed something, I should be wearing a glove! I went back to the stand that dispensed the plastic bags and sure enough, there was the dispenser for gloves. This supermarket obviously valued hygiene and didn’t want shoppers to be poking, prodding and squeezing the produce with their germ encrusted bare hands! So there we all were, a little team of veggie shoppers, with our matching plastic gloves, testing out our potential purchases without leaving a sign, smudge or skin cell on anything! I now know to look for gloves at all future grocery stores! We set off on our journey and unfortunately were back on busy roads; busy roads with cracks and holes and roundabouts. It wasn’t much fun. We had some sections of bike path every now and again, but for most of the day we were in the thick of it with traffic. 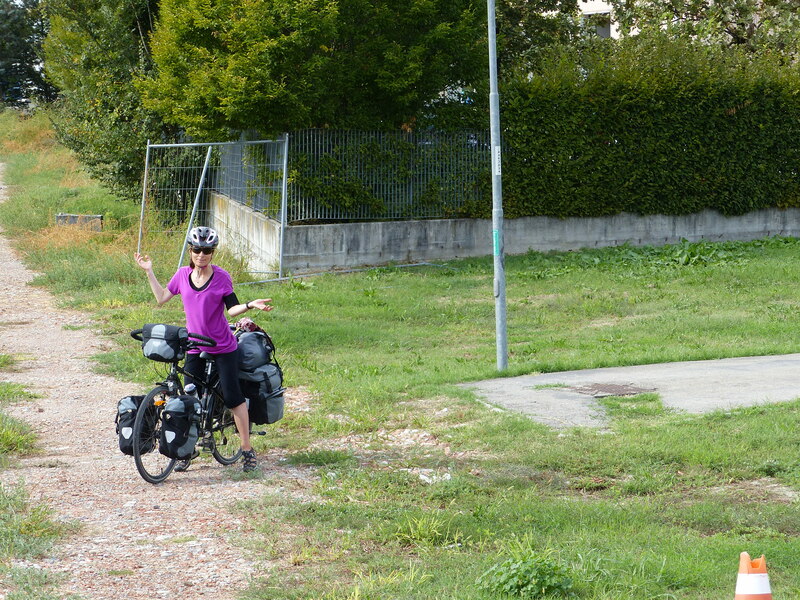 We passed another couple of touring cyclists, who looked to be a father and son team, who asked us for directions. Steve got out the map on his phone to show them and they pulled out their paper maps and Steve was able to point them in the right direction. We got chatting and they were from Germany. They asked where we were from and they were amazed that we were from Australia and even more amazed that we were from Tasmania! They asked if we had been to Germany and we said, unfortunately we missed Germany. “It is very good,” the young man said, “you don’t need a map because everything tells you where to go. The roads are very good too, not like here and there are paths for the bikes.” It seemed they had also been experiencing the roads in need of maintenance and the traffic hazards on their pedalling expedition. We wished each other well and wheeled off in our respective directions. “No,” I agreed, “it isn’t much fun.” We had been in the thick of traffic, getting rocked by trucks and with cars zooming past us constantly. In those situations, we can’t look around us, we can’t stop for photos, there’s no shoulder on the road to get even a little distance from the traffic and it’s hard going and no fun at all. 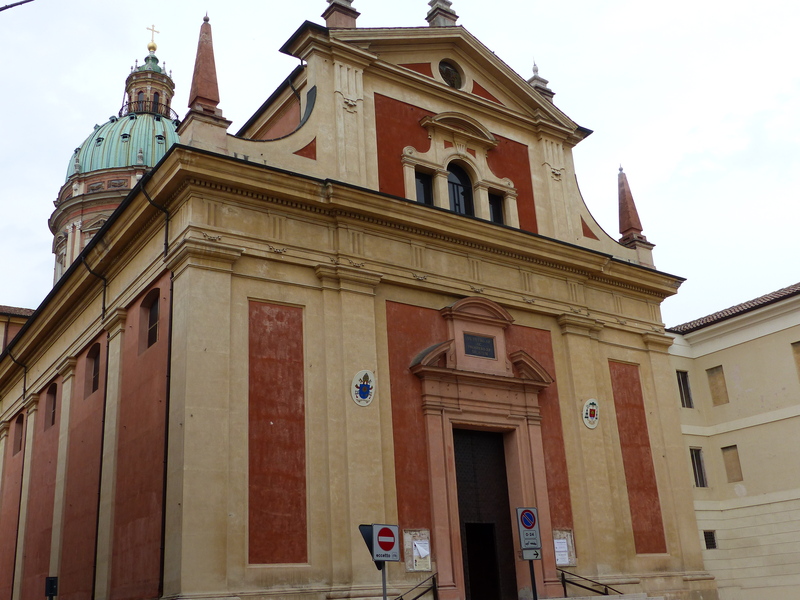 Our destination for the day was Reggio Emilia. This city is probably best known for its education system, in particular its early childhood education. It places great importance on enabling children to think, express their thinking in multiple ways, develop creativity and essentially learn with a deeper, conceptual level of understanding about the world. The approaches used in Reggio Emilia have influenced many teachers all across the world and I’ve worked with many kindergarten teachers who try and use the Reggio philosophy. 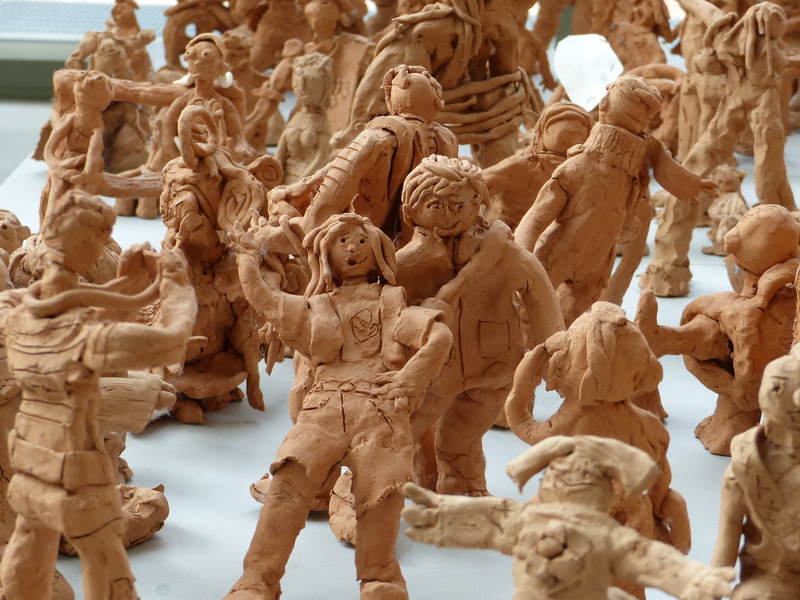 Harvard has also used the approaches from the Reggio education system in their projects and work. So, after looking at the map and seeing it was pretty close, we decided to take a detour south and check it out. After elevenses, we hoped the onward journey would improve. It didn’t. The GPS had us once again, on highways, and pedalling along in heavy traffic, dodging craters and cracks. We had been going along for a while, when Steve signalled to pull into a side road. I saw that it looked like a quieter road, so I thought, great, we must finally be able to ride on some back roads. Steve stopped though, and didn’t ride down that road. He hopped off the bike, left it lying on the ground, took off his helmet, threw that on the ground and exclaimed, “I just need a break! I’ve had it!” We were both feeling the tension of riding along those dangerous roads, so we just stopped on the grass beside the road, had a breather, consulted the maps again and tried to figured out what to do next. Steve decided the GPS wasn’t helping, since we’d been on the horrible roads most of the day, so he looked at Google and fed some info into the GPS and decided we’d just make it up. In the past, whenever we’ve just improvised a route, it never seemed to end well, so anything could happen! We crossed the busy road and took some back roads and eventually found ourselves on a road with some traffic, but far less busy that we’d been dealing with. It was a nice change. We pedalled along, took a wrong turn, then u-turned and retraced our wheels, took the right turn and continued on…into a paddock. Hmmmm, I’m sensing some deja vu here! We have ridden through paddocks in France and found we shouldn’t have been there, when we discovered a gate at the other end of our track. We’ve been through wheat fields in England, because Dodgy Dave the GPS said it was a road, now here we were again, riding along with fields either side of us, through the middle of someone’s land. “Are we sure this is right?” I asked. “Yep, we’re going in the right direction,” Steve assured me. 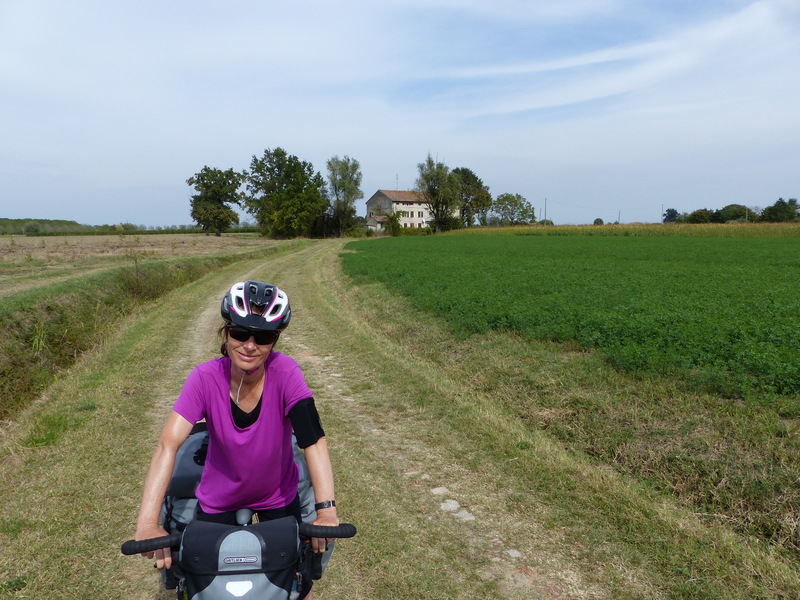 So on we pedalled through the paddock, with me trying to make myself feel and look as small as possible, in case we were noticed by a farmer and we really shouldn’t have been there! We came to a road, a proper sealed road and I pedalled onto it as quick as I could, because at least that was a place I knew I was allowed to be! 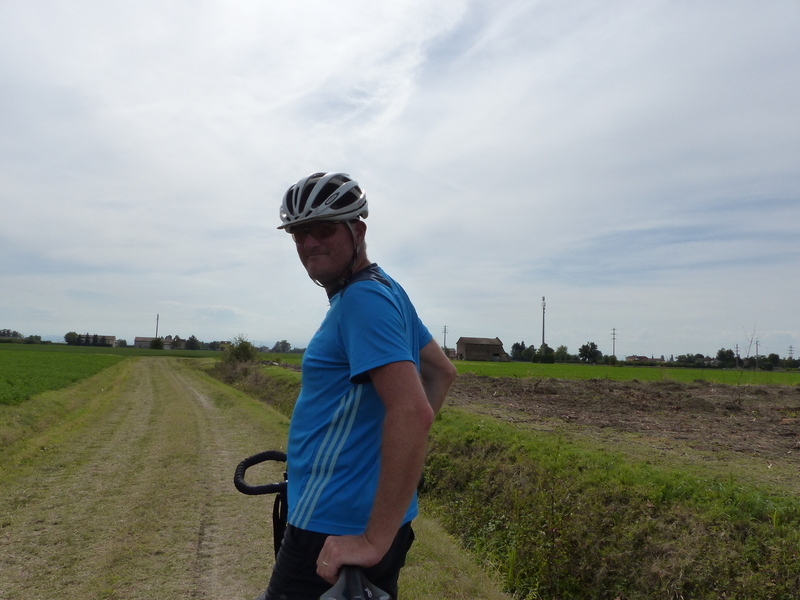 We managed to stay on some back roads and dodge the thick of the traffic and as we approached the outskirts of Reggio Emilia, we even got a cycle path, so we turned off onto that. We were wheeling along this nice, smooth, out-of-traffic path, when all of a sudden…no path! It just stopped! The nice path just went nowhere. Well, actually it did go somewhere…into a field! We didn’t want to return to a paddock though! So that little bit of cycling luxury was very short lived. The path to the paddock! 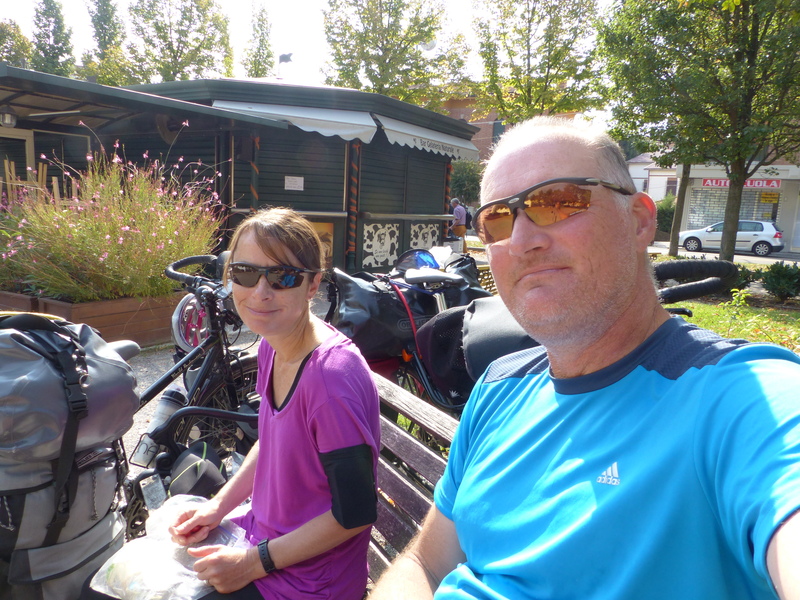 We navigated the busy ride into Reggio Emilia, had another honk and wave from a passing motorist, and located our cheap and cheerful hotel. Another friendly man at the desk showed us a spot inside where we could keep the bikes, we carted our bags up the tiny elevator to our little room, quickly threw everything down, then set off to explore the city with the time we had left in the day. First stop was the Reggio Children International Centre, where we looked around the exhibitions of the work done by children and watched videos of children and their teachers. I’ve always been impressed by the amazing work the children do here, from such a young age. It just goes to show if we back off, just give children some time to think and explore and learn, rather than trying to feed them what we consider to be the “right way to think”, they can amaze us with what they know and can do. It’s a shame we couldn’t take photos (although we took a couple covertly!) 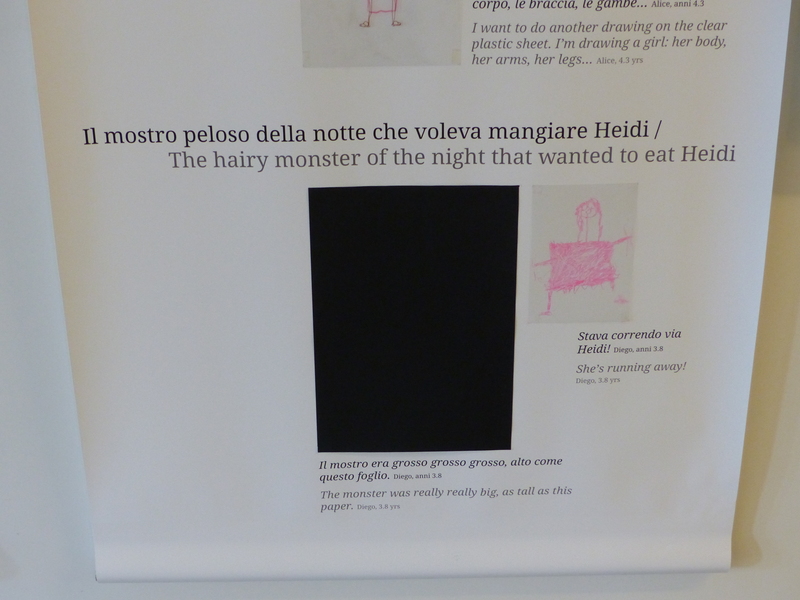 because the drawings, and language from the children, were incredible. The skill and maturity and high level thinking they showed, from children as young as two years old, was amazing. It was a really interesting place, but also made me a little sad at what we expect children to do and endure in our own education system. Children don’t get enough time to explore, create, discover and play, before they’re expected to “be academic” and get a worksheet put under their noses and expected to chant the alphabet. However, that is a soap box for another day! Anyone reading this who knows me from the education system, knows my passion for giving children time to play, discover and think…so I’ll get off my soap box about that for now! Oh no! Don’t eat me! 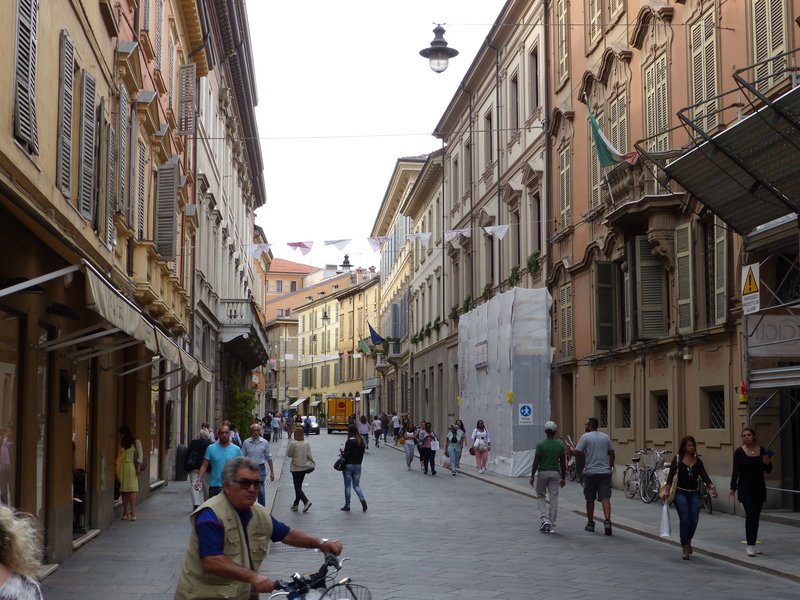 After a short stroll around the centre, we roamed the streets of Reggio Emilia. 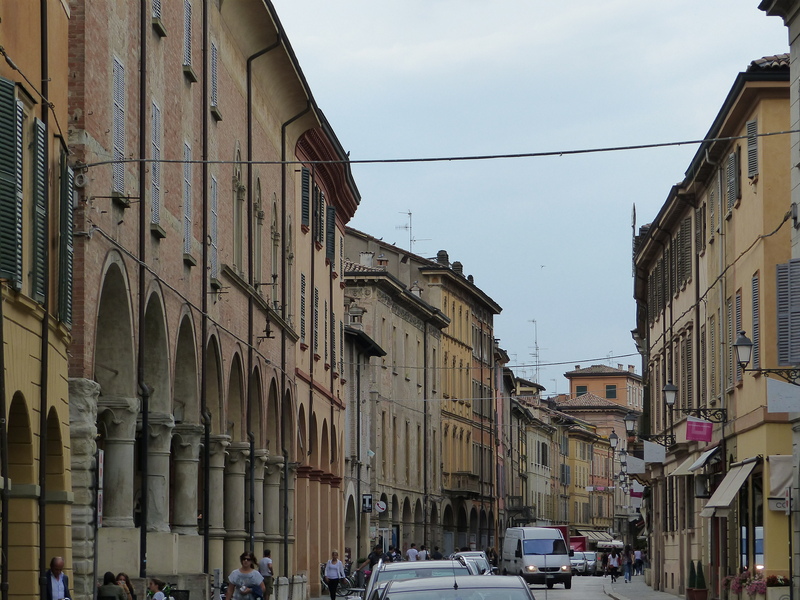 I think we were a bit spoiled when we stumbled upon Vigevano last week, because we haven’t been anywhere since, that’s matched it as a town to roam and explore. 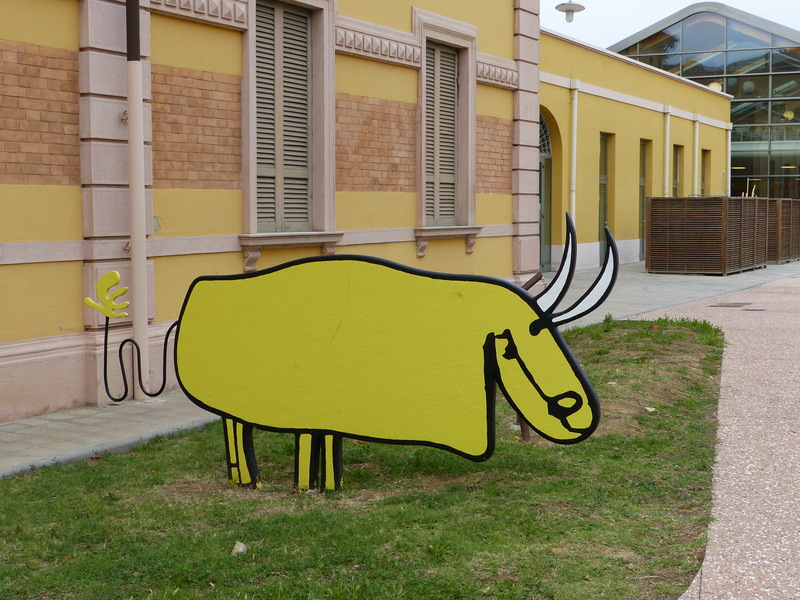 Reggio was very much another city, so we didn’t see much of the historic or charming scenes that we like so much. We were a bit rushed, so maybe we just missed them or roamed in the wrong places. We stopped off to get supper supplies, then headed back to our little room. We rode 67km today, mostly in the rapids of traffic, which wasn’t fun at all. We had another splendid sunny day though, which was fabulous! We still got to see new places and learn new things and discover and experience and explore, which is great and what it’s all about. So even with the hard parts of the day, doing those things still makes every day a good one. We’ll aim to do more tomorrow, but we will still hope for less vehicular obstacle courses! I’m going to sign off with some words from Loris Malaguzzi, the founder of the Reggio Emilia philosophy of education. I have always loved these words and they say so much. So here is Loris Malaguzzi’s The Hundred Languages of Childhood. 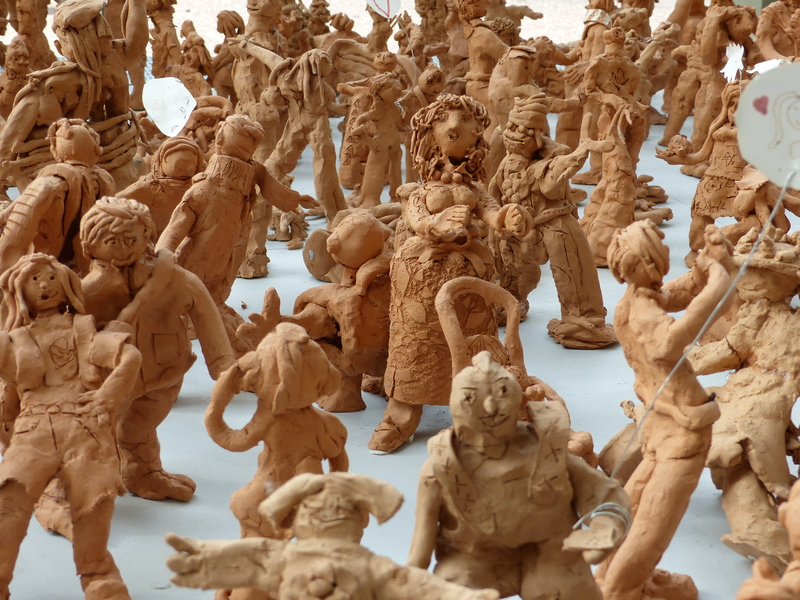 Oh how wonderful to go to Reggio, special, special 🙂 Clay figurines are amazing. Haha, yep, so far no rain! Yes, you were in my thoughts the whole time at the Reggio Centre!